Inspired by musicians such as Stevie Wonder, Marvin Gaye and Michael Jackson, Raghav Mathur has blown away audiences all over the world with his fusion of Hip Hop, RnB, Hindi, Reggae and Indian Classical Music. Raghav has a unique style that has made an impact and topped UK charts with hits like "So Confused' and "Angel Eyes". His first album "Story Teller" sold 1.3 Million copies! It's been four years since his successful first album, Raghav is now looking forward to releasing his new album "Identity" this year and will soon be releasing his new single "My Kinda Girl." Besides creating memorable music, Raghav also takes time to help causes that are closest to his heart. Raghav donates his time to helping charitable organizations such as the NSPCC, which is a UK based charity organization that is committed to protect children from cruelty- they have 180 community based projects and run a HelpLine and ChildLine. Raghav also supports the ACLT which promotes bone marrow and blood donations. Raghav had mentioned that he got involved with this organization through one of his close friends. 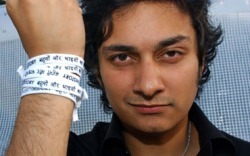 In order to support these two causes, Raghav has held fundraisers and benefit concerts.